Classical musicians compete fiercely – not only with their fellow countrymen but on a global scale. Orchestras want supreme musicianship, and they are hiring the best musicians, regardless of nationality. The key method to select the best violinist, oboist or cello player is through auditions. So, if you are a classical musician – wherever you are born and raised – aiming for a seat in a symphony orchestra – wherever in the world that might be – auditions are crucial moments in your career. You have to train especially for them and consequently music academies are offering audition training to their students. The problem is though, that orchestral traditions and styles differ from country to country, continent to continent. To give your best and to raise your chances of getting the job you have worked so hard for, you have to be aware of these different traditions. There are subtle nuances to how you and your playing is judged, and you want to be fully aware of these nuances. To take on this challenge, 5 prestigious music academies covering 3 continents are now collaborating in the Global Audition Training Programme. Using distance learning technology based on high definition audio sound and high speed internet connections, the programme gives students a unique opportunity to play mock auditions in real-time simultaneously in front of jury members from Europe, US and China. The programme was established in 2014 in a close collaboration between prestigious partners from East and West: Cleveland Institute of Music (US), New World Symphony, America’s Orchestral Academy (US), Shanghai Conservatory of Music, Royal College of Music London, and The Royal Danish Academy of music (DK). All partners involved are very excited about the project and believe it to be a huge contribution to the education of the future global musician. Using high performance audio technology and high speed networks, students, academy teachers, orchestral concert masters and solo players from renowned orchestras work together in a non-competitive atmosphere to bring out the best in the young players. Different traditions in relation to playing styles, sound and repertoire are identified and discussed among the international partners. 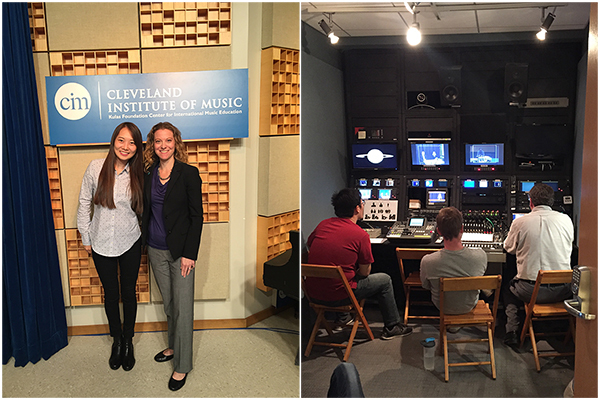 On October 11, 2016, in the span of one hour, Cleveland Institute of Music student and oboe player Sydney Lee auditioned for faculty in China, Denmark and Miami Florida, without leaving Cleveland. – A CIM player would be prepared to go on and audition for the Royal Danish Symphony Orchestra after this program, says Gregory Howe, director of the CIM Distance Learning program. – The Global Audition Training Programme expands the skill set of our students and prepares them for today’s multifaceted professional landscape. When the lines of communication are open and available, great discussion, learning and growth are inevitable. The biggest challenge is finding a time that works in everyone’s time zone!